July saw 41 executions, while only 17 such cases have been reported by the regime’s official news agencies. Two of those were public hangings. Two public floggings were carried out and more than 62 individuals were sentenced to lashes. The systematic murders including murders of poor porters by state security forces in Iran’s border regions, counting to 11 such cases. Religious and ethnic minorities, specifically Christians and Baha’is, are experiencing many restrictions, parallel to not being recognized by Iran’s ruling extremists and systematically placed under pressure from state officials and authorities. As June 2018 was coming to a close, the simmering wave of protests against shortages of drinking water in southwestern provinces, took on a sharp turn and erupted into radical anti-government protests which overshadowed all other issues. 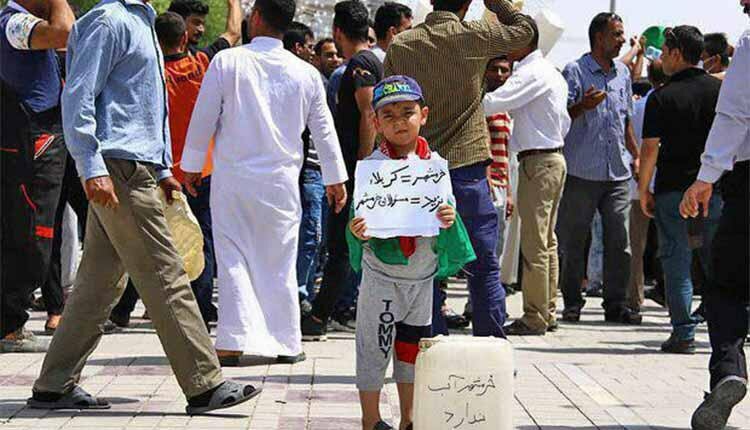 Thousands of demonstrators took to the streets protesting against shortages of drinking water in the city of Khorramshahr, some 650 kilometers from Tehran. The state security forces resorted to violence to disperse the protesters with firing pellet bullets, tear gas and even live ammunition as a result of which a number of demonstrators were injured. Shots could be heard on videos circulated on social media from the protests in the port city, along with the nearby city of Abadan. The state-run IRNA news agency said the protesters gathered on June 30 in the city, chanting slogans against the Iranian authorities. It said police fired tear gas late in the day as protesters threw rocks and garbage at officers. Some unrest continued into the night, the agency reported. After security forces used “unnecessary and excessive force” against the people who protested peacefully in Khuzestan Province over water scarcity and pollution Amnesty International called on Iran to ensure that Iranians have access to clean water and also to carry out an independent investigation into reports that security forces used “unnecessary and excessive force” against those who peacefully protested in Khuzestan Province over water scarcity and pollution. Iran Human Rights Monitor registered 41 executions in July, 17 of which were made public by the state media. On Wednesday, July 4, 2018, Three prisoners – two men and a woman – were executed by hanging at Urmia Prison in northwestern Iran. Their names have not been released. All were convicted of murder. A death row inmate in Dizelabad Prison of Kermanshah identified as Saleh Khanizadeh, 65, was executed on Wednesday, July 18, 2018, while he was given just a few hours’ notice before he is hanged, and relatives are not notified until the prisoner is already dead. Prison authorities delivered the corpse to the family after they received US $ 27 for the rope used for the execution. Mohammad Hossein Maleki, 47, the director of a website in Iran, has been sentenced to death on charges of “corruption on Earth.” A court in Isfahan has issued the ruling. Maleki was arrested by intelligence agents on March 1, 2017 and spent three months in solitary confinement. He is facing charges of “selling satellite CCcam accounts to reopen other satellite channels.” He is currently held in the general ward of Isfahan’s Dastgerd Prison in central Iran. Kurdish Political Prisoner Ramin Hossein Panahi has remain in danger of imminent execution. Kurdish political prisoner Zeinab Jalalian called on the people of Iran as well as international human rights organizations to take action to abolish the death penalty in Iran. Kurdish political prisoner Zeinab Jalalian who was herself on the death row for four years, has written an open letter addressed to death-row political prisoners Ramin Hossein Panahi, Zanyar and Loghman Moradi, Kamal Hassan Ramezan, etc., calling on the people of Iran and human rights organizations around the world to form a front against the death penalty. Iran Human Rights Monitor recorded 9 arbitrary murders. On July 2, the state security forces in Zahouk Village in Minab, northwest Iran, opened fire on a vehicle of young man who was carrying four jerry cans of gasoline. On July 3, the state security forces in Saravan, southeast Iran, opened fire on a vehicle on suspicion of smuggling, killing two and leaving two others injured. On July 12, the state security forces opened fire on villagers for lifting water from local wells in Talkushk village, some 15 kilometers from southern city of Kazerun. As a result of shooting, a young man identified as Iman Ahmadi was killed. On July 20, a porter identified as Hakim Heydaranlou, was shot dead by the state security forces in Chaldoran border area in Urmia, northwest of Iran. On July 24, the state security forces opened fire on the vehicle of a Balouch man. The driver identified as Omid Raisi burned in the fire resulted from the shooting. He was carrying fuel with his vehicle. On July 24, a porter identified as Rashid, 34, was shot dead by the state security forces in Urmia border region, northwest of Iran. On July 5, a prisoner identified as Hamid Shahouzehi, committed suicide in Zahedan Central Prison, after the authorities refused to address his case. The prisoner had currently been kept in a state of limbo. Disturbing video footage of a public flogging was obtained from inside Iran on July 24, 2018. In the video masked men are seen hitting a man wearing prison uniform with a whip, while a small crowd watches without protesting or intervening. The state security forces are present at the scene. On July 25, 2018, an Iranian court convicted and sentenced Mohammad Sani, a teacher in the city of Bushehr, to two years behind bars and 74 lashes allegedly in relation to his nonviolent participation in teacher’s protests during 2015. Sentences for 39 Gonabadi dervishes have been issued by the Revolutionary Court. They have been sentenced to 208 years behind bars, 1554 lashes, 8years deprivation of social activities and 10 years of exile. During the month of July. at least 45 members of Sufi order, were sentenced to a total of 450 years behind bars, 1435 lashes, 46 years of exile and 12 years ban on seeking membership in any parties and 12 years ban on leaving the country. Abolfazl Azizi a teacher from Qazvin province, arrested during widespread protests earlier this year was sentenced to prison and lashes. The Sentences of 11 detainees arrested in the Shazand County during the large demonstrations in Iran at the end of 2017 and beginning of 2018, issued by the judge Mohammad Reza Abdollahi of the Arak Revolutionary Court. They were sentenced to prison and lashes. Iran Human Rights Monitor registered 1029 arrests across the country including 487 politically motivated arrests, 9 arrests on religious and ethnic grounds, and 533 social arrests. On July 1, 129 people were detained during the recent Tehran Bazaar demonstrations in protest to skyrocketing prices and the plunge of the Iranian currency to the dollar. On July 1, at least 200 demonstrators were arrested during Khorramshahr protests against drinking water scarcity. At least 80 Azerbaijani activists arrested in the lead-up to an annual July protest at Babak Fort in East Azerbaijan province against discrimination targeting the Azeri minority. The arrests took place in several cities, including Tabriz and Ahar in East Azerbaijan province and Meshgin Shahr in neighboring Ardabil province, usually following home raids. Forty-six members of what security officials have described as an online “modeling ring,” including eight female models, were arrested at an unspecified date in the southern Iranian province of Hormozgan according to an announcement by local police chief Gen. Azizollah Maleki on July 16, 2018. Iran’s jails are also home to at least 640 political prisoners, an issue Tehran refuses to recognize or provide any information about. These individuals are constantly tortured and placed under inhumane pressures. Political prisoner Soheil Arabi has been threatened to death by two inmates incited by prison authorities. He has been intentionally kept at ward 2A controlled by the IRGC in the Great Tehran Penitentiary where non-political prisoners, including potentially violent offenders are being kept. Prison authorities have literally placed a bounty on his head and two inmates are threatening him constantly. The two have reportedly been told have if they murder Mr. Arabi, they will be rewarded with transfer to another prison. Soheil Arabi was recently taken to hospital after being severely beaten last week and suffered a series of injuries, including a broken nose. The brother of Ramin Hossein Panahi, an Iranian Kurdish political prisoner on death row said the prison authorities have told the dissident that he would either be executed or killed behind bars. Arrested in June 2016 for alleged membership in the Kurdish Nationalist party (Komala), 23-year old Ramin Hossein Panahi is currently incarcerated in the central prison of Sanandaj, capital city of Kurdistan province, western Iran. Osman Mostafapour, held at Urmia Central Prison, northwest Iran, who is in his twenty-eighth year of imprisonment, has been deprived of furlough. Osman Mostafapour, born in 1967, was arrested on July 14, 1991. He was sentenced to death on charge of murder by branch 1 of the Revolutionary Court in Urmia by Judge Javaheri. The sentence was commuted to 10 years’ imprisonment in 2000. Osman Mostafapour was summoned to branch 3 of the Revolutionary Court and was sentenced to 25 years in prison in the second case on charge of cooperation with the Kurdistan Democratic Party. Zafar Ali Moghimi a member of Iran’s Gonabadi Sufi minority has been on hunger strike since more than 110 days ago to protest against violation of detained dervishes’ rights and demanding their unconditional release. He has lost 35 kilograms and suffers from low blood pressure, joint and eye pain and physical weakness. The prisoner is at risk of losing consciousness, according to Moghimi’s cellmates. Sunni political prisoner Ghasem Abasteh, has started a hunger strike since July 17, protesting to being denied hospital transfer. He has currently been held at Rajaei Shahr Prison of Karaj. Political prisoner Arzhang Davoudi, has been transferred to solitary confinement since April 3, 2018. He has been denied any family contacts and visits. Prison authorities deliberately delayed taking political prisoner Arash Sadeghi to the hospital on July 22, 2017 and he was returned to prison without a doctor seeing him. He was due to undergo tests for a rare form of bone cancer. Revealing a high-security prison in Ahvaz where largely political prisoners are kept and tortured. It’s called the Ahvaz Clinic Prison and it’s known for restraining and protecting information. The political prisoners’ section in this detention house has six rooms and about 100 political prisoners are detained in this section. This prison is in Charshir Square, meaning four lions, behind the Aboozar Hospital. In the political prisoners’ section water is usually out of use so it’s not possible to bathe regularly. The sewage is always full and contaminates the space. The sanitary condition is far too low and prisoners do not have drinking water, they can only get two bottles after waiting long hours. A report describes that prisoners speaking Farsi are held in Room 1, which also includes supporters of the People’s Mojahedin of Iran PMOI/MEK. Room 2 is where alleged Wahhabi and Salafi defendants are being kept. Room 4 is for prisoners without security ties, who are at times hired by the prison agents to spy on other prisoners. The room is also called the service room. Two atheists are detained here and Hojat is one of them who was arrested for putting up slogans (graffiti) in Izeh, Khuzestan Province as well as holding a social media admin. He has been severely tortured in this detention center and his hands crippled ever since. This prisoner was raped several times while being tortured. Prison agents first told him they would let him go, but have now issued a ten billion toman release bill for him. The lack of facilities and the unclean environment is itself a hardship, but prison agents also impose mental and psychological pressures on detainees. Given the diversity of beliefs and religions of prisoners, the Ministry of Intelligence tries to create hatred and disagreement among them so they give each other up. A young Baha’i woman, Sarir Movaghan was expelled from Iran’s Islamic Azad University in the city of Isfahan one semester before completing her bachelor’s degree in architecture because of her religious beliefs. Another Baha’i student, Houman Imani was also expelled from university based on religious grounds. The state security forces raided the home of Iranian Pastor Youcef Nadarkhani Sunday morning, where he was arrested and taken to the Branch 2 of the Revolutionary court of Rasht, northern Iran. Youcef Nadarkhani had been sentenced to prison and internal exile however no official summons has been issued for him. Hundreds of Gonabadi Dervishes who were arrested earlier in February were sentenced to harsh prison terms and punishments during the month of July. While suffering physically, many of the detainees were taken to prisons and kept in unbearable conditions in solitary confinement, according to social media reports and images. The detained dervishes were tried behind closed doors without access to lawyers. On Tuesday, July 24, dozens of devoted fans of Shamlou attempted to hold a commemoration ceremony to mark the 18th anniversary of his death, near his grave at a cemetery in the city of Karaj, west of Tehran, but they were prevented by the security forces. The suppressive forces closed the cemetery gates in order to prevent the gathering by Shamlou’s grave, according to a member of Iran’s Writers Association who attempted to attend the event. The gates remained shut even after the security forces dispersed the crowd, according to eyewitnesses. The security forces arrested five people, including two members of the Writers Association, which has been under pressure from the authorities in recent years. Shamlou was a groundbreaking poet who used his work to push for greater freedoms in Iran and describe the atmosphere of fear and repression that plagued the country following the 1979 revolution that brought down the Shah and led to the Regime’s rule. He is considered by many to have been Iran’s most influential contemporary poet, but much of his work was banned by the Regime, who notoriously oppose anyone who questions them. Shamlou also wrote poems that criticised the rule of the Western-backed shah, who was also a dictator who oppressed the Iranian people, so the Shah banned some of his work before 1979. Human Rights Watch (HRW) awarded Shamlou the Freedom of Expression prize for his efforts in support of human rights. He died in Tehran in 2000.